Share this product and receive a $1.96 sharing discount. 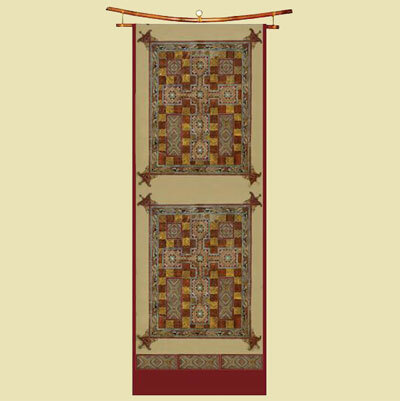 An inspiring wall hanging, table overlay or silk to wear that will enrich your life. The Lindisfarne Gospels is one of Britain's greatest artistic and religious treasures. Written and illuminated in honor of God and St Cuthbert circa 715-20, the Gospels are famous for the superb quality and intricate design of its decorated pages. A single artist-scribe, Eadfrith, later Bishop of Lindisfarne, was responsible for both script and decoration throughout these Gospels. The volume is painted in a large and subtle range of pigments made from a selection of local plants and minerals ­ the work of someone attuned to the environment. Each of the four Gospels (St Matthew, St Mark, St Luke and St John) opens with a miniature of the appropriate Evangelist and an elaborate decorative "carpet" page based on the form of a cross. Pope Damasus recognized the need for an accurately-translated Latin text of the Gospels to be used during services. In 382, he appointed a young, scholarly priest, Jerome, later St Jerome, to revise all Latin translations of the Gospels. In due course, St Jerome's translation was adopted by the Church as the official Latin text. Over 300 years later, it was used for the Lindisfarne Gospels. St Jerome's Letter to Pope Damasus introduces the manuscript. The British Library is the national library of the United Kingdom. It provides world-class information services to the academic, business, religious, research, and scientific communities. The Library offers unparalleled access to the world's largest and most comprehensive research collection. Measures 12" x 66", Hand-screen printed, 100% Silk Twill, hand-rolled hem, Burgundy border. Bamboo Textile Hanger is sold separately. Purchase hanger for 12" Silk.